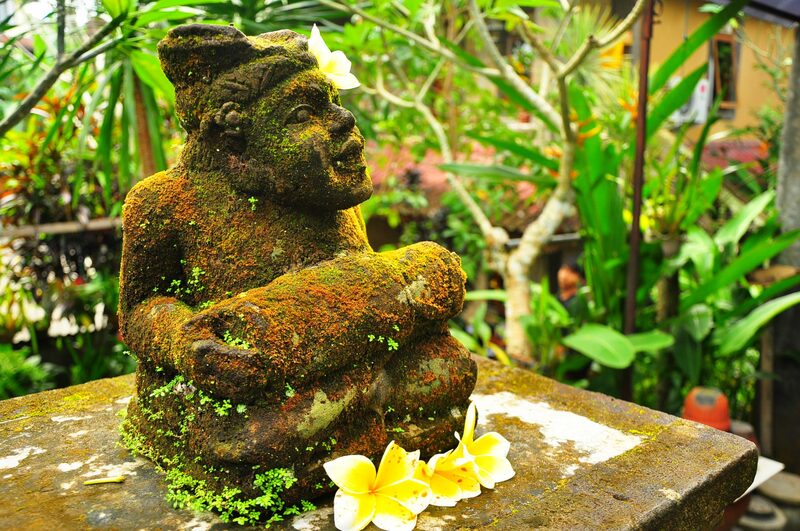 The first time I went to Bali I liked Ubud. It’s friendly, and unlike most parts of the island, you can walk around and there are things worth walking to, like cafes with good coffee and places to have a facial or a foot massage. 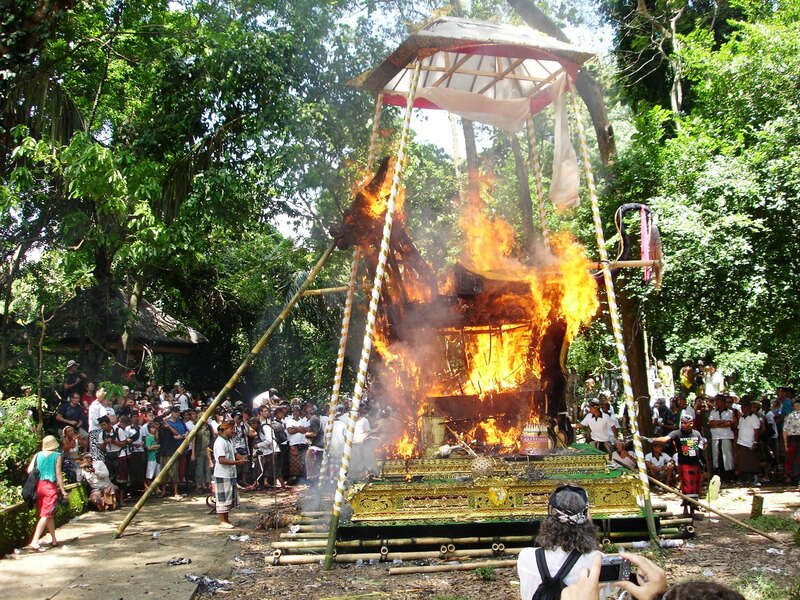 Plus there is the Monkey Forest, where I and the rest of Ubud witnessed a cremation three years ago. This time around Ubud is a bit busier and there are more tourists, but on the positive side, the pavements have improved. At least walking up Jalan Monkey Forest is less of an agility test and more a simple aerobic workout. The place for decent cheap food (no msg) and to meet other travelers, along with Balinese men who like to meet other travelers, is Dewa Warung, Jalan Goutama. Here I met a man who owned 26 roosters. They slept outside his door piled in bamboo baskets, but as they never shut up I don’t know how he ever got any rest. The Balinese have a special relationship with the rooster; not that they use the word rooster. Rooster apparently is an American word. To the Balinese it’s all chicken (ayam). Mine’s prettier than yours: Balinese men and their roosters. Ayam bagus! Chickens are good (bagus) for eating, and cockfighting. Cockfighting is not just a great way to lose all your money really quickly, but is also an offering to the Gods. The women spend hours each day lighting incense, making bamboo baskets and collecting flowers and snacks to put in those baskets and the men make friends with noisy chickens. Ayam bagus! Once you start looking, there are men playing with their roosters, or taking roosters for playdates, everywhere. I also find myself drawn to Soma Cafe in Dewi Sita with its organic, vegan “high vibe” scene. It does that irritating thing rampant in Bali of stating a price then adding tax and service, but I like the fresh juices and “superfood” drinks and this is where I head when I feel a cold descending and banish it in a couple of days with some potions to boost immunity and strengthen the digestion. If you are into nutrition, Ubud is a great place to be. That tax and service thing was taken to new lows at another vegan cafe called Alchemy (sitting right under a communications tower) where a slice of takeaway cake costing $5 in a third-worldy place had another 15% tax and service added. (But not all the cakes – just some of them.) When I asked why, I was told it was because someone had to slice it and put it in a bag. But isn’t that why you have staff? I would have thought if you work in a cafe then taking something out of the fridge and putting it in a bag was your job. Does that mean if you buy a pair of earrings, service should be added to that too? I hate that. Service should be optional – for good service, not to top up inadequate wages – and tax is the proprietor’s problem surely, not the customer’s. If the tax is compulsory, then add it in. State your price and be done with it, dammit. Setting out a price then adding to it to me is a pernicious practice amounting to low-level fraud. Sari Organik farms and serves fresh organic food in two lovely restaurants and they even manage to sort out their own arithmetic too, so hurray for them. There is fraud of a different kind taking place at the market: Idiot Tourist Fraud. I go to buy a cheap pair of sunglasses (as I lose and break them regularly). The stallholders want $15. Uh huh. Last time I bought a pair like this they cost $3. As I laugh and walk away, the price tumbles. I don’t want to rip anyone off, I want a price where we both get reasonable value. In the end I get a pair of cotton trousers and some glasses for $10. My rooster-loving friend approves. I know some tourists pay 10 times what a local would pay and stallholders like that, but they should regard this as a bonus rather than a regular event. For a treat I venture to Mozaic, a world-class dining experience in Jalan Raya Sanggingan, and the best in Indonesia according to the Asia’s 50 Best Restaurants 2013. Here French-American chef Chris Salans creates memorable Franco-Indonesian fusian dishes, such as roast duck breast with kluwek puree and hazelnut-orange salad. Sommelier Cok Bagus Senajaya chose great wines to accompany the six-course degustation (tasting) menu, accompanied by attentive but never overbearing service. The evening began with a drink and a canape in the stylish lounge, then the serious consumption took place outside in the tropical garden. 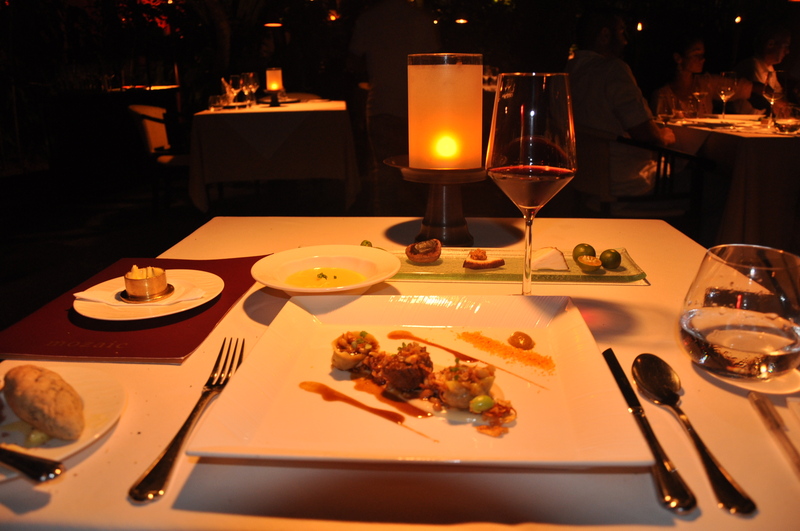 With soft lighting and a relaxed atmosphere, it’s a great choice for a romantic assignation, a special occasion or simply the need to indulge in quality. On my way back to Malaysia I also sampled a variety of accommodation. Alindra Villa with its collection of wooden buildings from different parts of Indonesia has friendly staff and a lot of character and just relaunched after refurbishments and adding a spa. It also offers private pool villas with butler service, and while I had never felt the need for my very own full-length pool and jacuzzi area before, I now understand the appeal.There were seven places to shower in my large, two-bedroom villa, three of them outside. The almost brand-new Le Meridien at Jimbaran is sleek and sassy with a bouncy soundtrack, stylish contemporary rooms and “lagoon access” from those on the lowest level. I went exploring by wading through the farthest reaches of this meandering waterway and felt like Katharine Hepburn in The African Queen, but without the leeches or having to drag a boat around. Sadly, there was no Humphrey Bogart. The rooftop bar is perfect for watching the sun set over the bay, and Bamboo Chic serves a great breakfast (with some delightful French influence). The restaurant’s signature marinated pork hock is a mighty serve of meat. If you haven’t eaten too much in the hotel, you can always try the seafood cafes on the beach, but I had a great massage in the spa instead. Never a great fan of Kuta, its noise and tourists are absolutely no problem when you can retreat to the Sheraton Bali Kuta Resort. Perched on top of the similarly new upmarket Beachwalk mall, the resort itself only opened in December 2012 and is designed to make the most of sea views from the pool, the breezy foyer and lounge, and classically styled rooms which all have their own balcony. 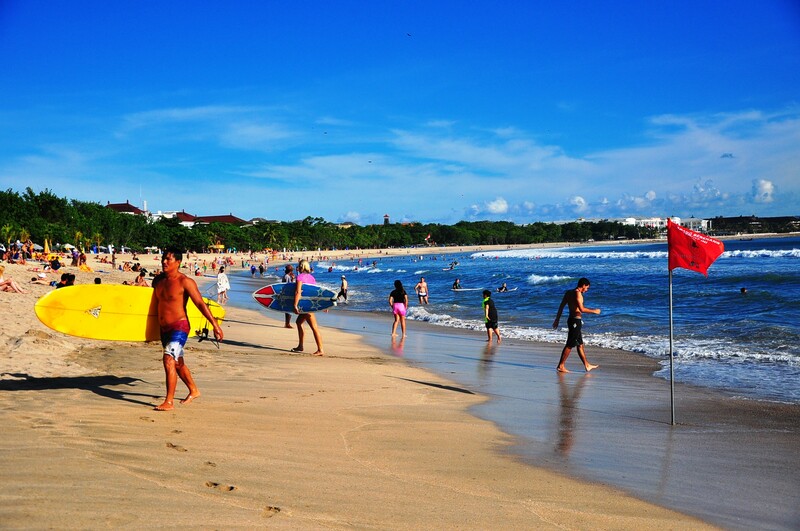 To be honest I hated Kuta the first time I went, but if I was staying at the Kuta Sheraton I’d be happy to return. The spa is also seamlessly soothing with a gentle sauna, and the bathrooms are very smart with freestanding tubs. 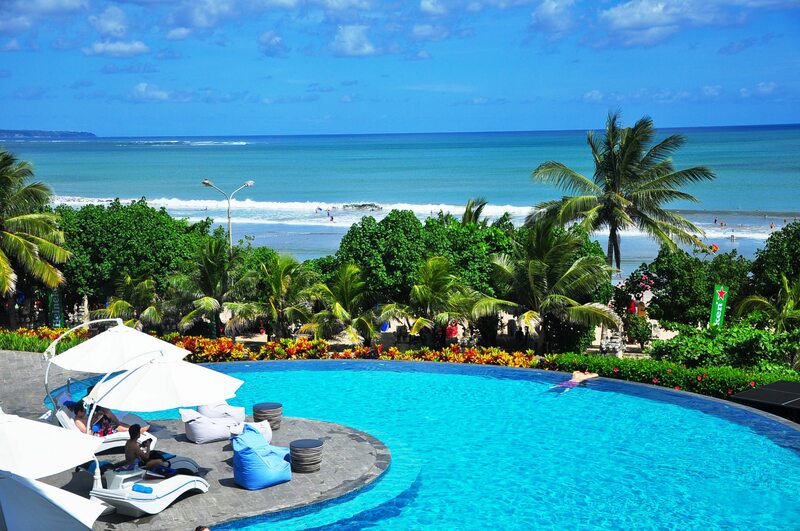 This is Sheraton’s debut hotel in Bali, and they offer some deals on booking rooms, so there are affordable options. And as you would expect from a hotel like this, you can eat your own weight in food at the huge buffet breakfast.